Welcome to Palso Cars! - All the auto news you can handle! During last year’s auto show in Geneva, Nissan showcased the Invitation concept that previewed the new edition of the Note hatchback. The concept car hinted that the Japanese car manufacturer was planning to have a new look for the vehicle and a lot shared the same opinion as the car looked uninspiring. 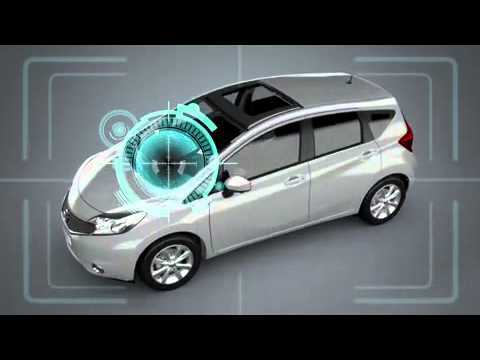 The 2013 model of the Nissan Note may change your impression about the car. Gone are the days of a boxy configuration. It now features a more clever styling with a nice voluptuous shape that make it more attractive. You can say that it will get the thumbs up of the supermini market in Europe. The Nissan Note is schedule to roll out in Europe before the end of the year. Under its hood is a 1.2-liter gasoline engine that gives out 80 horses and a torque of 81 lb-ft. Another engine is a supercharged DIG-S unit with a 1.2 liters of displacement that cranks out 98 horses and delivers a torque of 105 lb-ft. Buyers wlll also have choice to pick a diesel engine, a 1.5-liter DCI powerplant that outputs 90HP and a torque of 162 lb-ft that has been sourced from Renault. This engine is actually the most efficient of all the choices with a mileage of 3.6 liters for every 100 kilometers compared to the supercharged gasoline engine that returns 4.3L per 100km. The Nissan Note will be assembled at the Sunderland factory of Nissan in the United Kingdom side by side with the compact crossover Nissan Juke and the Europe-bound Nissan Leaf. Audi recently unveiled its refreshed Q5 crossover, which is set to be in showrooms before the end of the years as a 2013MY. When you go around the new Q5 designers did not implement a lot of major changes but the a lot of tweaking happened under the skin like a revised lineup of engines which now includes an option to get a Q5 hybrid. The 2013 Q5 by Audi comes with six engine options: three powertrains will be TDI turbodiesels, two will be TFSI petrol engines, and the hybrid. All of the engines will have direct fuel injection equipped with forced induction. They will also have a start-stop system to help on the fuel economy department. Although these engines boast of better performance, their fuel economy has been improved by as much as 15%. For the Audi fans in the United States, the Audi Q5 will have a base model that is equipped with a turbocharged 4-cylinder engine while the range topper will get a supercharged V6 under its hood. In between the two will be the hybrid version which will have a turbocharged 4-cylinder engine paired with an electric motor that would be launched soon. The transmission will will come as an 8-speed automatic with some markets getting an option to have a 6-speed manual gearbox or a dual clutch S tronic with seven speeds. There will also be options to get the Q5 as a front wheel drive ride and as an all wheel drive quattro. For the based 4-cylinder engine of the Audi Q5, it will be a 2.0L turbocharged TFSI that gives out 225 horses and a torque of 258 lb-ft. The supercharged 3.0L V6 that takes the place of the older 3.2L makes 272 horsepower and a peak torque of 295 pound-feet. The supercharged V6 can bring the Audi Q5 from o to 60 miles per hour in just 6.0 seconds. The Audi Q5 Hybrid teams up a 2.0L TFSI turbocharged engine with an electric motor. The tandem is connected in parallel and transfers all the power to the ground via an 8-speed automatic gearbox. Top executive Dany Bahar of Lotus was orderedto continue with their five-year program which was designed in 2010 to change the entire model lineup of the Lotus brand even as Proton, its parent company in Malaysia is being acquired by DRB Hicom. The process of ownership might slow down in the next sixty days as laws in Malaysia requires for change of the ownership of a company. During this time Lotus will not be able to tap the Proton funds. According to a recent interview, the plans of the Lotus brand has been presented to its new Proton owner. DRB Hicom has instructed the management of Lotus to continue with their plans. The technical issue though is that there will be a short pause in tapping the available funds as Malaysian laws declare. The new owners of Proton though are open to any discussion which will put the Lotus brand on sale. But Dany Bahar denied that the brand is close to being sold already to an interested party like the investment company Genii based in Luxembourg. Genii already owns the F1 team of Lotus. As far as the Lotus boss is concerned, he is not aware of any particular company that is about to close the deal. Bahar explained that Proton needs to consider the implications of selling Lotus. Bahar also shared that there is a big demand for their Lotus Exige and also for Evora GTE. Lotus is currently on the second year of its 5-year program. Bahar proudly shares that their new V8 powerplant for the supercar and the new gearbox are progressing well and developing on schedule. Lotus should be testing their supercar prototypes on the asphalt this May. Honda Motor Company, Ltd. has recently released the official first batch of photos of the CR-V SUV concept car. The new model is set to roll out into showrooms in United Kingdom sometime in the autumn of 2012. The Honda CR-V SUV concept car will not be unveiled this September at the Frankfurt Motor Show. According to official reports, the concept car will make its first grand debut in California, USA during the Orange County International Auto Show in September. But Honda fans, do not fret because the Japanese brand will still be revealing its all-new Civic model at the Frankfurt Motor Show. The automaker has done a series of changes on its current CR-V model which paves the way for the SUV to have a more aggressive look. The concept car’s lower front bumper is one of the most prominent changes that can be easily spotted along with the new grilled design and the slimmer headlights. According to Honda, these changes will improve the model’s aerodynamics. The side sills are more aggressive in the concept car that compliments its new alloy wheels. While the official photos do not show its rear, it is assumed that the vertical light design on the model’s rear will be retained. Reports say that the CR-V SUV concept car’s interior will be more spacious along with improved load capacity. Since the carmaker did not say anything about engine specifications, it is also assumed that the CR-V SUV concept car will get the current CR-V 2.0-liter petrol engine or the 2.2-liter diesel variant that both carry 148 bhp. You read it right, the MINI Goodwill comes not with a mini price. The limited edition MINI inspired by Goodwood is trimmed to have the specs of a Rolls Royce. The BWM owned MINI will only be rolling out 1,000 units of the MINI Goodwood. If you are an autophile and of course has a big stash of money to spend, the company is now accepting deposits with deliveries expected to start March next year. You might be wondering why this MINI is inspired by Goodwood. It actually refers to the home of the design division of Rolls Royce. The luxury car marque is all over the car from its doors, dashboard, interior cladding, air vents, central console, heated seats, roof lining, and carpets in Cornsilk. The surfaces of the door handle and dashboard comes in an exclusive Walnut Burr that only Rolls Royce has. The body of the car is finished in Diamond Black of Rolls Royce and rolls on a multi spoke sport alloy rims. The MINI Goodwood depends on the Mini Cooper S’ 184 bhp 1.6L 4 cylinder turbocharged powerplant. It comes with Xenon headlights, parking distance control system, satellite navigation, and automatic air conditioner. In an amicable cost-cutting attempt, two renowned automakers, PSA/Peugeot-Citroen and BMW, come together to design and develop a software and several components for its hybrid models. According to a joint statement that both car companies released just recently, the amicable 50-50 partnership will take the official name BMW Peugeot Citroen Electrification. The joint operation would start on the second quarter of this year. The BMW Peugeot Citroen Electrification would provide both BMW and PSA/Peugeot-Citroen with car parts as early as 2014. The head of BMW’s purchasing strategy unit, Wolfgang Guellich, and PSA/Peugeot-Citroen’s head of customer satisfaction unit, Jean Leflour will be spearheading the joint venture of BMW Peugeot Citroen Electrification. According to Norbert Reithofer, the CEO of BMW, the partnership’s joint project would enable them to reach certain economic goals when it comes to electrification. Reithofer adds that the venture is a step towards sustaining mobility. When it comes to engine development, BMW and PSA has been in cooperation since 2006. Last year, both companies released a statement that they would come together to create a 4-cylinder gas engine that complies with the new environmental regulations of the European Union. The announcement of BMW Peugeot Citroen Electrification is, clearly, a manifestation of the memorandum that both companies signed last October for the development of the said hybrid-power system. According to both BMW and PSA, several supplies would be in contact with the joint BMW Peugeot Citroen Electrification during the creation process. It’s possible that the partnership would also sell to other manufacturing firms.